Roto Punch adds holes to straps, dog collars, belts and more! Roto Punch adds holes to straps, dog collars, belts and more! . Repairs snaps on clothing and works on leather, vinyl, plastic and fabrics. 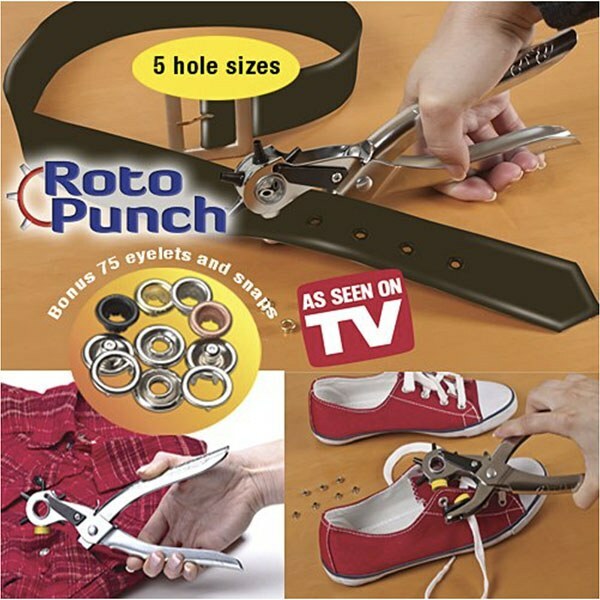 Roto Punch tool is the complete home mending solution that lets you quickly punch a hole in a belt, purse strap or watch band, add eyelets to sneakers or outdoor gear, and even replace worn out snaps on pants and blouses. Effective once you figure out the instructions. Not so great for holes in cloth, but excellent for holes in leather and plastic.